The Belle River Power Plant northeast of Detroit. 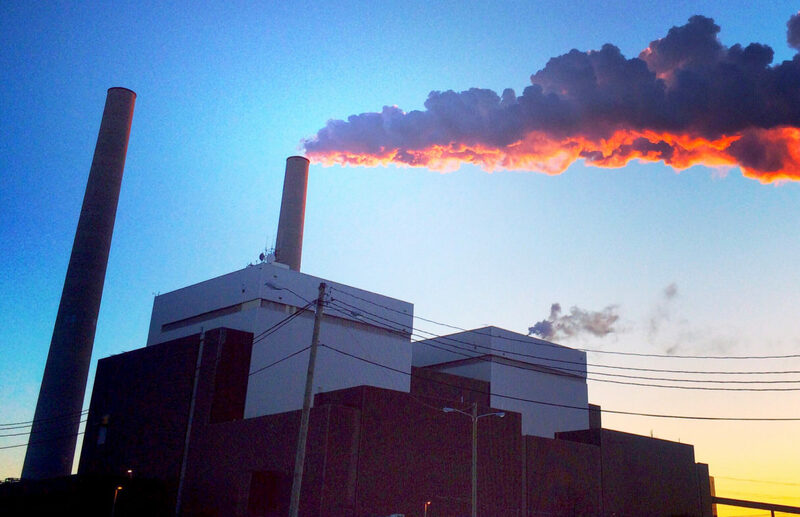 Plans by Michigan’s two major utilities to close coal plants within the next 15 years are having a ripple effect on smaller companies that purchase power from them. Case in point: The municipal utility in Traverse City, which on August 14 became the first power company in Michigan to declare a 100 percent renewable energy goal by 2040. While the Traverse City Light and Power (TCL&P) board approved the plan in response to community demand, plans by DTE Energy and Consumers Energy to close two coal plants starting in 2030 will force smaller utilities to seek other options, said TCL&P executive director Tim Arends. TCL&P gets about 40 percent of its power from DTE’s Belle River plant near Detroit and Consumers’ J.H. Campbell plant along Lake Michigan. Belle River is scheduled to close in 2030 while Campbell’s three units will be phased out starting in 2031. “It’s a huge concern for us. We have to find replacement energy for that,” Arends said. Ten municipal utilities contract for power at the Campbell plant, while 11 get power from Belle River. The Michigan Public Power Agency, which supplies power for 22 municipal utilities, has a 4.8 percent and 37.2 percent ownership interest in the Campbell and Belle River plants, respectively. Under TCL&P’s 2018 strategic plan, the utility — which doesn’t fully own any generation — will pursue power purchase agreements for solar and wind energy. Of its roughly 75 megawatt capacity need, the utility also gets about 3 percent from landfill gas. “I can’t say the (coal closures) are affecting our plans other than creating opportunities that go in line with our goal,” Arends said. TCL&P board member John Taylor agrees. Renewables currently make up about 15 percent of TCL&P’s portfolio. Arends is confident TCL&P will hit an intermediate goal of 40 percent renewables by 2025 through new solar power purchase agreements expected to be announced in the coming months. He said he contacted the Michigan Public Power Agency to see whether 40 percent by 2025 is achievable. “The challenge will be how it impacts customer rates,” Arends said. Of TCL&P’s 12,700 customers, 25 percent are commercial customers that provide 80 percent of the utility’s revenue. “We don’t want companies to relocate because our rates are too high,” he said. Taylor said utility staff has recently been asking the board of its “tolerance for paying more” for renewable energy. He said new contracts will likely be decided on a “project by project” basis. Board Chairman Patrick McGuire cast the only no vote on the plan, reportedly over cost concerns. Clean energy advocates say even though TCL&P is a relatively small utility, its goal is significant for pushing other power companies to follow. “It brings to our state the reality that it’s possible to set and achieve 100 percent renewable energy goals and to really start moving in this direction,” said Kate Madigan, director of the Michigan Climate Action Network. Also, the goal moves beyond pledges from cities — including Traverse City and Grand Rapids — to power their municipal operations with 100 percent renewables. Taylor said even though TCL&P is a small player in Michigan’s energy market, it could spur similar goals from other utilities.